Do You Use a Man Bag? The British Chiropractic Association has been in the news recently with a study they did on men with back pain and their man bags. Apparently 60% of men polled use a man bag and 66% of the men polled also have had back pain before. The man bags they wore had an average weight of 6.2kgs with a laptop usually making up the most weight in a bag. I use a laptop bag myself and, like the picture, I use a single strap over my shoulder type. So does it mean you have to get rid of the trendy man bag in order to avoid back ache and use a boring double strap school bag instead? That’s what’s today’s post is asking. 1 Really, Man Bags Cause Back Pain? 5.1 What is the Average Handbag Weight? Really, Man Bags Cause Back Pain? Do you use a “man bag“? I wonder, does a laptop bag count as a man bag? For me a man bag can be cool or not so cool from a style point of view. It also depends when do you use a man bag. If you carry lots of goods like laptop, tablet PC (ipad, galaxy tab etc…), papers or files, I can understand the need for a daily man bag. You can see below the contents of one guys man bag (reading book, mobile phone, camera, wallet, mp3 player, pens and pencils, note books). No notebook, netbook or tablet PC here. According to the poll taken it would seem quite a few men in the UK use a man bag. Also quite a few men get back pain who use man bags. Most back pain studies say the population in general does experience back pain so that is no surprise. I do wonder if there are that many man bag UK men out there, maybe London. I do believe that heavy man bags, women’s handbags, ruck sacks, school bags etc… repetitivley carried only on one shoulder could contribute to a back ache episode like a pain between the shoulder blades. There was a great video about a day in the life of a spine showing poor repetitive posture leading to a sore back and shoulders. I guess also if you don’t have a car and want to do gym after or before work you would need a bag to carry all your gym things in. That might be quite different from the trendy man bags being used by football stars and celebs like David Beckham. What would David carry in his man bag? Here is the marketing research article from the BCA. With all this talk on man bags how should you carry a man bag in a back friendly way. At the end of the day a man bag can contribute to a back pain episode because you are carrying a weight and it can be asymmetrical weight on your body forcing only certain muscle to work. If you repeat this daily then this could be a problem for you in the future or currently just like always carrying your wallet in the same back pocket causing a “wallet sciatica“. I recently came across this video with Dr Oz of Oprah Winfrey TV show fame talking about handbag weights on women’s health. 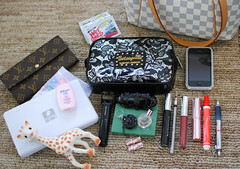 Dr Oz quoted a survey study done by the American Chiropractic Association on the weight ladies carry in their handbags. In the UK a similar research study has been done by department store, Debenhams. See what Dr Oz says about the weight of a woman’s handbag and how she carries it can affect her back in his show “Handbag Hazards”. Also find out what the average weight of a UK woman’s handbag is and how it has changed over the years by 100%. So in fashion is it a no pain no gain situation? Well here are two articles talking about how a woman’s health can be affected by what she decieds to carry in her handbag. The first is by the Here is the American Chiropractic Association in relation to their handbag study, the second by Reuters talking about the Debenhams handbag reaserch in the UK for 2010. What is the Average Handbag Weight? In the UK Debenhams clothing store found that over the last 15 years the weight in women’s handbags has changed. The average weight of a British woman’s handbag increased from 1.4kg in the mid-1990’s to a peak of 3.5kg in 2006/7. It is amazing to have read how women carry laptops in their handbags. To be honest I haven’t seen a nice macbook pro sticking out the top of a ladies handbag. Maybe that will change again with the ipad for 2010. In either case for women it looks like be careful what you decide to carry in the new handbag. It may be bad for your back health. If you own a handbag please weigh it and tell me in the comments how much it weighs. I’d love to know.